When the conveners of this seminar began collaborating in 2005, they each approached faculty development from two entirely different backgrounds: academia and high-level executive training. Their combined research efforts have thus led to the development of distinctly comprehensive professional communication programs. In this highly interactive workshop, we will identify and focus on your individual strengths and difficulties relating to teaching effectiveness. The discussions will be broadly applicable to all disciplines and subjects. During the seminar, you will be guided through a project that targets a weakness in your teaching effectiveness identified through self-analysis. By the end of the week, you will learn key principles, develop skills, and apply practical strategies to improve your classroom teaching. Topics to be considered include syllabus development, content design, presentation delivery, feedback methods, assessment tools, conflict resolution, educational technology, and overall course management. In addition, there will be discussions related to career advancement and intentional leadership. This seminar is suitable for faculty members of all levels and experience who engage in classroom teaching. While not required, you are strongly encouraged to bring a computer that has access to presentation design software such as PowerPoint or Keynote. You will receive a copy of the book A Guide to Better Teaching, authored by the conveners, which will support many of the concepts and strategies covered in the seminar. In addition to her field of clinical expertise, Dr. Jahangiri’s scholarship is on teaching effectiveness and curriculum design. As department chair, she has mentored faculty at all levels of experience, while managing the teaching efforts of over seventy-five faculty and overseeing a highly diverse curriculum. She has held frequent global faculty training programs for more than 45 schools focusing on: syllabus development, content design/delivery, feedback methods, assessment tools, conflict management, educational technology, and leadership skills. Her principles on teaching effectiveness are discussed in her book A Guide to Better Teaching (Rowman and Littlefield 2012), which is used as a core textbook at several business schools. Tom Mucciolo is president of MediaNet, Inc., a presentation skills and leadership effectiveness company in New York City. An internationally recognized industry expert in visual communications, Tom has served as a presentation skills consultant for major corporations since 1985, concentrating on the scripting, visual design, and delivery skills associated with presentations. High-profile communicators, including corporate leaders, politicians, and media personalities, as well as presenters at every organizational level, demand his coaching expertise. In 2005, Tom joined the faculty of New York University to increase the communication effectiveness of teachers and administrators. He collaborated with Dr. Leila Jahangiri to complete an extensive study on teaching and presentation effectiveness, the results of which have been published in the book A Guide to Better Teaching. Tom is the co-author of five other books: Purpose, Movement, Color (MediaNet, Inc.), and Special Edition Using Microsoft PowerPoint 2000, 2002, 2003, and 2007 (Macmillan, Pearson, MediaNet). He is also co-author of two interactive multimedia learning modules, Mechanics-Basic Skills and Media-Design Skills, which cover delivery and design skills. To prepare students to think systematically, creatively, and critically requires new thinking about not only what should be taught in school, but also how to develop valid assessments that measure and support the competencies needed for success in school and beyond. What have my students learned? How will I know what they have learned? How can I modify the learning experience and/or instruction to help students meet my learning objectives? What are the different modalities for assessing student learning? When are the best opportunities for assessing student learning? How can I reflect on my own instruction and evaluate the quality of my teaching? This interactive seminar will provide hands-on experience with a variety of assessment models and approaches. Curated readings and videos will be provided. Participants will have the opportunity to create assessments related to their course(s) as well as self-assessments of their teaching. Participants will share their ideas and work together to develop new assessment ideas. By the end of the seminar, participants will be able to design learning objectives that align with assessments and course goals; design various types of formative and summative assessments; design and apply various evaluative strategies for instruction; and present a coherent assessment plan. Elizabeth McAlpin is the project director of research and outcomes assessment at NYUIT. Her team assists faculty in assessing technology-enhanced course designs aimed to increase student engagement and outcomes. Prior to this role she was the assistant director of learning and curricular development in the Global Learning and Innovation group at NYUIT, where she led a team of 12+ instructional technologists who worked with faculty to reimagine their courses with innovative pedagogy using technology and media. She holds an undergraduate degree from Denison University, an Ed.M. in instructional technology and media from Teachers College, and an M.A. in educational communication and technology from New York University, where she also is currently pursuing her doctorate. In addition to her full-time position, she also teaches as an adjunct at NYU. Her interests include effective educational design, innovative pedagogy and assessment, and educational technology and media for all kinds of learning experiences. Anandi Nagarajan is the assistant director of instructional and interactive design at NYUIT. Her team specializes in educational design technology, media production, and interactive development, and facilitates the design and implementation of technology-enhanced initiatives across the university. She has an Ed.M. in learning, cognition, and development, and a Ph.D. in educational psychology from Rutgers University, where she has designed and taught numerous courses in face-to-face, hybrid, and online settings. She continues to serve as an adjunct instructor at Rutgers and Indiana Universities. Her research in teaching and instructional design focuses on combining optimal models of instructional pedagogy with effective and efficient technologies to maximize opportunities for active student engagement. Her main areas of expertise are in problem-based learning, formative assessment strategies, and active learning methods. She serves on the doctoral research committee of two doctoral students at Rutgers, conducts manuscript reviews for several research publications, and volunteers for organizations, including Educause, Online Learning Consortium, and the American Educational Research Association. In this seminar, we will explore how to design and implement a capstone project in which students serve as marketing consultants to real businesses. The sessions will be highly interactive, combining lectures, discussion, and the hands-on development of a capstone project. Drawing on his experience facilitating capstone projects in business classes, the convener will demonstrate how he has connected student teams to local food businesses to collaborate on expansion plans. Students benefit in multiple ways, learning from their clients’ experience and expertise, while in turn helping local entrepreneurs increase sales. The marketing capstone project has the potential to transform students, especially economically disadvantaged students who lack entrepreneurial role models. Preparing for the initial client interview. Preparing a marketing research plan. Identifying target markets and populations. Examining and selecting primary and secondary research tools. Developing and executing a digital, research-based marketing campaign. The second part of the seminar will culminate in the collaborative development of possible capstone projects based on the examples and methodologies discussed. As part of the Principles of Marketing class (BUS 220) I taught this spring at Hostos Community College, I incorporated a capstone project involving the creation of four consulting teams of five students each. Each team was assigned the task of conducting marketing research, and preparing a marketing plan for several businesses currently incubating at the Hot Bread Kitchen (HBK) food business incubator at La Marqueta, namely: Jessie’s Nutty Cups, Harlem Seafood Soul, Pabade Bakery and Clean Plate Co.
All four business owners came to class to share their stories with students, who saw these young entrepreneurs as fantastic role models. Some of these businesses have already expanded their sales to WholeFoods (Clean Plate Co.) and Dean & Delucca (Jessie’s Nutty Cups). Students could see themselves creating and pursuing a business in the food sector; they learned about some of the real life challenges of starting and growing a small business. At the end of the semester, students presented a marketing plan, which included the creation of websites and digital marketing assets. Those presentations, shared in a business competition setting similar to CNBC’s Shark Tank, allowed students to share not only the results of their findings, but also the execution of marketing strategies and tactics for their clients. Prof. Jorge Silva-Puras is a principal at Interaktiva, LLC, a consulting firm that provides advisement to Puerto Rican and Hispanic businesses, and the Distinguished Lecturer on Business at the Hostos Community College of the City University of New York (CUNY). Previously, he served as a regional administrator of the U.S. Small Business Administration, with responsibility for SBA’s programs and services in New York, New Jersey, Puerto Rico and the U.S. Virgin Islands. Before joining the SBA, Mr. Silva-Puras spent 13 years in the private sector, including nine years in brand management with The Procter & Gamble Company. He then served as chief of staff to the Governor of the Commonwealth of Puerto Rico, in addition to other senior positions, including secretary of economic development & commerce, executive director of the Puerto Rico Industrial Development Company (PRIDCO), and president of the Economic Development Bank for Puerto Rico. Mr. Silva-Puras has served as chairman of the board of directors of the Puerto Rico Industrial Development Company, the Puerto Rico Tourism Company, the Puerto Rico Commerce and Trade Company, and the Puerto Rico Science and Technology Trust, among others. He also served as member of the board of directors of the Government Development Bank and the Economic Development Bank for Puerto Rico. He received his B.A. from Yale University, J.D. from the University of Puerto Rico, and M.B.A. in international management & finance from the University of Texas at Austin. Few would argue that food has taken on new importance in the United States in recent decades. Activists declare the United States a “toxic food environment” and seek to establish soda taxes. Food safety issues have taken on new importance as e coli outbreaks in organic spinach cause sickness and even death. Many, too, are wringing their hands over what they see as the extinction of family meals and the disappearance of home cooking. There also is heightened interest in sustainable food production through urban and community gardening, initiatives designed to combat food deserts as well as provide better access to nutritious fresh food. Add to the mix the boom in culinary tourism—restaurants, food television, books, magazines, cooking classes, artisanal products, and the search for “authentic” cuisine of every sort—and the result is a surfeit of interest and anxiety about food. The current interest in food has historical roots that reach back centuries. Yet in the last 30 years or so in the United States, we’ve witnessed an emerging food “revolution” that has attempted to counter (or at least circumvent) the worst aspects of the industrialization of food. This seminar will explore the American landscape of food in all its broad socio-cultural, historical, environmental, and health contexts. Topics will include: the industrialization of food, the turn to organic and sustainable agriculture, the complexities of improving the American diet, food waste, issues of social justice and equal access to good food, and the U.S. vis-a-vis the globalization of the food supply. Amy Bentley is Professor in the Department of Nutrition and Food Studies at New York University. A historian with interests in the social, historical, and cultural contexts of food, she is the author, most recently, of Inventing Baby Food: The Industrialization of the American Diet (University of California Press, 2014). Iran is frequently presented in the media, but how much do we really know about this nation’s complex, diverse, and dynamic society? This week-long seminar will explore the various factors and manifestations of the 1979 revolution that overthrew the Pahlavi monarchy and led to the fashioning of the Islamic Republic in Iran. The seminar will study the revolutionary foment through contemporary sources, multidisciplinary materials, and an array of perspectives. This history of the revolution will set the stage for understanding post-revolutionary Iran and such questions as why the multi-class, urban, and ideologically plural revolutionary coalition gave way to an Islamist form of government; the extent to which Iran is simultaneously a republic and a clerically dominated political system; and how the revolutionary spirit is or is not sustained across four decades and different historical and global contexts. Interdisciplinary readings for the seminar will include assignments appropriate for undergraduate learners. Discussions will focus on ways to introduce primary and secondary source material on Iran to students new to the topic. The seminar will include invited academic and non-academic guests and possibly field trips. Arang Keshavarzian is associate professor and director of graduate studies in NYU’s department of Middle Eastern and Islamic Studies. His general fields of research and teaching are comparative politics of the Middle East with a focus on issues related to political economy, authoritarianism, and social movements. Much of his writing focuses on modern Iran, although Keshavarzian has studied, conducted research, and taught in several other countries in the Middle East and North Africa. Keshavarzian’s research has revolved around questions of change and continuity as reflected and produced by socioeconomic hierarchies, political imperatives, and collective solidarities. His book, Bazaar and State in Iran (2007), traces the structure of the Tehran Bazaar under the Pahlavi monarchy and Islamic Republic, and sheds light on the organization and governance of markets as well as state-society dynamics. His current research examines the Persian Gulf in order to analyze the processes of late imperialism and globalization from the perspective of local circuits of trade and transnational alliances. Keshavarzian’s essays have appeared in Politics and Society, International Journal of Middle East Studies, Economy and Society, and Geopolitics, in addition to a number of edited volumes. He is on the editorial committee of Middle East Report and a member of the Board of Directors of the Middle East Studies Association. How can we account for the appeal of the screen personae of Lillian Gish and Douglas Fairbanks to audiences of the 1910s and 1920s? Of Barbara Stanwyck and William Powell to audiences of the 1930s and 1940s? Of Marilyn Monroe, Rock Hudson and John Wayne in the 1950s and 1960s; Pam Grier or Jane Fonda in the 1970s; or Halle Berry, Tom Cruise, or Angelina Jolie today? Their popularity must be understood in relation to the specific social and cultural contexts in which they appeared. Each persona possessed great resonance for its own era, but can hardly be imagined affecting a different era in a similar way. Imagine a Hollywood film featuring Pam Grier in the 1920s or one with Lillian Gish today? Gender images that resonate deeply for one era can seem preposterous for another. Why, and what pedagogical pertinence does this issue have? A related and complex issue involves the significance of the off-screen lives and sexualities of behind-the-camera directors, such as Dorothy Arzner, Pedro Almodovar, and George Cukor, for an understanding of their films. Furthermore, how does the gender and sexual orientation of audience members affect their understanding of the films they watch? The same film shown to a diverse audience can elicit wildly different responses. This seminar will explore the diversity of ways in which gender and sexuality have been represented and understood in (primarily Hollywood) films over the past century, and will establish contexts for understanding their socio-cultural significance. We also will examine the presence and absence of women, gays, and transgender people behind the camera, and will address questions whose answers vary substantially with the era to which they apply. Those questions include, among others: what is a woman and what is a man; what agency do they have in determining their professional fates or in resisting unacceptable options imposed upon them; what are the power relations between women and men; what are the social roles and responsibilities available to women; and what determines whether women/men appear admirable or subversive, progressive or reactionary, desirable or transgressive in the eyes of a particular audience? The seminar will draw upon theoretical and critical approaches developed within the fields of women’s studies, feminist film studies, masculinity studies, art history, literary studies, gay-lesbian-bisexual-transgender studies, and social history. We will explore representations of gender and sexuality with attention to race, nation, age, and genre, as well as practices and politics within the film industry. We also will discuss filmic images of women and men with reference to those simultaneously circulating in the culture at large, as well as ways in which such images have changed over time. Pertinent readings will be made available to seminar members and films will be shown and discussed in class. The responses to these materials, drawing upon the cultural and pedagogical backgrounds of seminar members, are an important component of the seminar. Guest speakers will share their expertise and pedagogical applications on this topic. The seminar will engage material pertinent to many disciplines, and we will discuss ways in which we can incorporate its content into diverse curricula. William Luhr is professor of English and film at Saint Peter’s University and co-chair of the faculty-level Columbia University Seminar on Cinema and Interdisciplinary Interpretation. His recent books include Film Noir for John Wiley-Blackwell Publishing, 2012 (Chinese edition, 2014) and Screening Genders (co-edited with Krin Gabbard) for Rutgers University Press, 2008. The fourth edition of his Thinking About Movies: Watching, Questioning, Enjoying (co-authored with Peter Lehman) for John Wiley Publishing will appear in 2018. Luhr’s writings have been published widely, and he lectures in both national and international venues. The year is 1913: the place, New York City. The cultural capital of the USA is abuzz with new ideas, both in art and in life—and a new generation of thinkers, calling themselves Bohemians, is intent on combining the two, bringing new ways of seeing the world, fostered in art and literature, to bear on their own lives and the life of the nation. At the Armory Show, works by Post-Impressionist painters and sculptors are on display alongside those of the Ashcan School, challenging traditional perceptions of what art should depict and how; on the streets, workers are organizing for labor rights, and women of all classes for—or against—the vote. Using the award-winning Reacting to the Past pedagogy, this seminar uses a game-based format to plunge participants into an atmosphere of cultural ferment and political possibility, giving each individual participant a personal stake in the passionate debates that animate the salons, cafes, and dive bars of Greenwich Village. Greenwich Village, 1913: Suffrage, Labor, and the New Woman transports participants to the beginning of the modern era when urbanization, industrialization, and massive waves of immigration were transforming the U.S. way of life. As the game begins, suffragists are demanding a constitutional amendment for the vote. What, they ask, is women’s place in society? Are they to remain in the home or take an active role in the government of their communities and their nation? Labor has turned to the strike to demand living wages and better conditions; some are even proposing an industrial democracy where workers take charge of industries. Can corporate capitalism allow an economically just society or must it be overturned? African-Americans, suffering from the worst working conditions, disenfranchisement, and social segregation, debate how to support their community through education and protest, thereby challenging their continuing marginalization in both the South and the North. Members of all these groups converge in Greenwich Village to debate their views with artists and bohemians, who are in the process of remaking themselves into the new men and new women of the twentieth century. Their spirited conversations not only show a deep understanding of nineteenth-century thinkers like Elizabeth Cady Stanton and Karl Marx; they are also informed by such contemporaries as Charlotte Perkins Gilman, Jane Addams, W.E.B. Du Bois, Emma Goldman, John Dewey, Franz Boas, and Sigmund Freud. The game asks what social changes are most important as well as how one can or should realize these goals. Greenwich Village 1913 uses the Reacting to the Past (RTTP) pedagogy, an award-winning series of immersive role-playing games that actively engage students in their own learning. RTTP draws students into the past to promote engagement with big ideas and improve writing, oral communication and other academic skills. Students assume the roles of historical characters and practice critical thinking, primary source analysis, and the art of argument, both written and spoken. The roles and debates are informed by classic texts in the history of ideas; class sessions are run entirely by seminar participants, in character and in debate. Recognized with the 2004 Theodore Hesburgh Award for pedagogical innovation, RTTP has been featured in numerous publications including Change magazine, the Chronicle of Higher Education, and the New York Times; faculty members at over 300 institutions worldwide have adopted the pedagogy. A recognized pedagogical innovator, Rebecca Stanton teaches courses at Columbia University, CUNY, and NYU, and has introduced the Reacting to the Past pedagogy to faculty from all over the nation at numerous workshops and presentations. She also pioneered an after-school program using the Greenwich Village game for Harlem high school students, with grant support from the Teagle Foundation. Professor Stanton holds a Ph.D. in Russian literature from Columbia University and has published extensively on the literature and culture of the Soviet period, with a particular focus on the interfaces between literature, life, and politics. 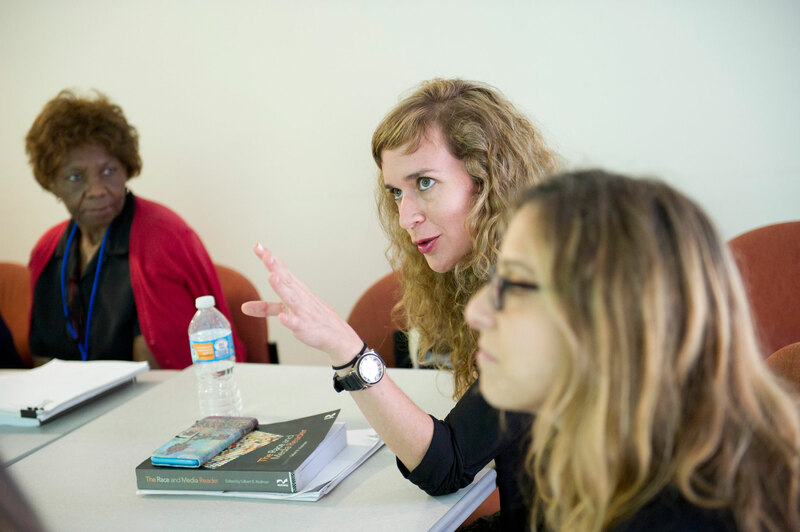 In her teaching, she has used games both within and outside her home discipline, immersing students in 1917 Petrograd, 5th-century (BCE) Athens, and late Ming China, among other adventures. As journalism programs at colleges across the nation highlight digital news platforms and media, social media has become an integral part of the curriculum. The use of Twitter, Facebook, and Instagram for reporting is no longer a novelty, but a given. Such tools—useable by anyone—are altering how journalists do their jobs and how people consume news. The changes caused by social media present as many challenges for learning and communication as they do opportunities, calling for enhanced media literacy in the academy and beyond. Teachers need to consider—with their students—how social media impacts scholarship and instruction in the classroom, and how they can take advantage of its many benefits. We need to consider questions both practical and ethical: What exactly should journalists be tweeting or sharing? How can we best communicate our stories, or our research? What skills do journalists and other professional communicators need to succeed in today’s ever-changing media environment? And as teachers, how can we best leverage the interactivity and engagement afforded by social media for the purpose of student learning? This seminar will tackle these questions and more through a series of discussions and readings. Participants will also have the opportunity to develop and implement a social media strategy for delivering some aspect of their own research. David J. Dent is an associate professor of journalism at New York University and has also taught in the Africana Studies program. Dr. Dent has twice received NYU’s Golden Dozen award for excellence in teaching and service and has served as advisor and workshop leader for the University’s Faculty Resource Network. He has also served on the board of The Calhoun School and is a graduate of Morehouse College and Columbia University Graduate School of Journalism. Dr. Dent is author of In Search of Black America, a New York Times Book Review Notable of 2000. Since the Industrial Revolution, Earth’s climate system has been affected by both natural and human influences. The natural influences consist of external factors—such as volcanic eruptions and changes in the sun’s energy output—and the internal “noise” associated with phenomena like El Niños and La Niñas. “Climate noise” varies on a wide range of different space and timescales, yielding a rich background of natural fluctuations in climate. It is against this backdrop of natural variations that the “signals” arising from human activities must be identified. These signals are associated with human-caused changes in atmospheric greenhouse gases, particulate pollution, and land surface properties. The separation of anthropogenic signals from natural climate noise has been the subject of scientific inquiry for nearly four decades. The history of this field of inquiry will be covered in the seminar. Areas of emphasis will include: (1) the transition from studies of simple, global-mean changes in surface temperature to pattern-based “fingerprint” research involving a wide range of different climate variables; (2) the credibility of the numerical models and observations used in separating climate signals from climate noise; (3) human impacts on the large-scale conditions that influence hurricanes; and (4) “best practices” in responding to common myths and misconceptions about climate change. Since the 1995 report of the Intergovernmental Panel on Climate Change (IPCC), all major national and international scientific assessments have concluded that there is compelling evidence for a “discernible human influence” on global climate. These assessments also find that human-caused climate change poses significant risks to the lives and well-being of billions of people, and to the rich diversity of the biological world. Yet in 2017, this signal in scientific understanding is being overwhelmed—at least in the United States—by the persistent noise of willful ignorance. Such ignorance hampers progress in finding effective solutions to the problem of reducing greenhouse gas emissions. In this less than brave new world of fake news and alternative facts, it is imperative to communicate understanding of the causes, likely impacts, and seriousness of climate change. Strategies for achieving more effective communication will be explored in the final part of the seminar. Benjamin Santer is an atmospheric scientist at Lawrence Livermore National Laboratory. Ben’s early research contributed to the historic “discernible human influence” conclusion of the 1995 Report by the Intergovernmental Panel on Climate Change. His recent work has attempted to identify human factors in a number of different climate variables. Dr. Santer holds a Ph.D. in climatology from the University of East Anglia, England. He spent five years at the Max-Planck Institute for Meteorology in Germany, and worked on the development and application of climate fingerprinting methods. He served as convening lead author of the climate-change detection and attribution chapter of the 1995 IPCC report, and was the convening lead author of a key chapter of the U.S. Climate Change Science Program’s report on “Temperature Trends in the Lower Atmosphere.” His awards include the Norbert Gerbier–MUMM International Award, a MacArthur Fellowship, the U.S. Department of Energy’s E.O. Lawrence Award, a Distinguished Scientist Fellowship from the U.S. Dept. of Energy, Office of Biological and Environmental Research, a Fellowship of the American Geophysical Union, and membership in the U.S. National Academy of Sciences. The successful slave revolution that led to the creation of the independent state of Haiti has spawned a large array of literary works in various genres by eminent Caribbean writers (principally francophone, anglophone and hispanophone). Seminar participants will read and interpret provocative works of drama (e.g. Aimé Césaire’s The Tragedy of King Christophe, Derek Walcott’s Haitian Trilogy), as well as of historical fiction (e.g. Alejo Carpentier’s novel The Kingdom of this World) that explore pivotal events in the Haitian experience during and after the revolution. Background readings in the historical and anthropological literature will provide cultural and social contexts for the discussion of the creative works (e.g. C.L.R. James’ Black Jacobins; Laurent Dubois’ Avengers of the New Word; Zora Neale Hurston’s Tell My Horse). Gregson Davis, Andrew W. Mellon Research Professor in the Humanities at Duke University, teaches in the Department of Classical Studies and the Program in Literature. He has previously taught at Stanford University, Cornell University, and, most recently, New York University. His primary research specialties are the interpretation of poetic texts in the Greek and Roman as well as Caribbean (francophone and anglophone) traditions. In the domain of Augustan poetry, he has published monographs on Horace’s Odes, Virgil’s Eclogues and Ovid’s Metamorphoses. His abiding interest in contemporary Caribbean poetry is represented by three books on the late Martinican poet Aimé Césaire, including a new English translation of Cahier d’un retour au pays natal: Journal of a Homecoming (Duke University Press, 1917). In the 2013 cinematic reboot of Superman, we discover a young Clark Kent clutching not a dime store comic book but … a well-worn copy of Plato’s Republic. What could possibly link this most American of films with this most Greek of texts? The Uses of Antiquity explores this and other surprising juxtapositions of the modern and the ancient worlds. Indeed, it investigates the very idea of “the classics,” as it surveys the ways in which we construct our modernity through appropriations (or annihilations) of classical themes, texts, and figures. The seminar will first introduce the concept of reception theory, a budding field of cultural criticism that analyzes the creation of meaning at the point of reception; the seminar will then take a strongly comparative approach, as texts and myths from antiquity are studied alongside contemporary versions, in such media as film, comics, theater, and even video games. In this way, we will gallop through very recent and often striking receptions of the classical world, including political, gay/lesbian, multicultural, and popular appropriations. In particular, we will explore especially ideological appropriations of the ancient world: art with a point to make—or an axe to grind. In this way, we’ll be formulating some ideas about what makes the classical world “classical”: why do we moderns insist on the periodization of history, and why do we invest the Greco-Roman world in particular with the mantle (and sometimes burden) of classicism? This seminar presupposes no knowledge of Greek or Latin, but does demand a good sense of humor and a willingness to jump down the rabbit hole of popular culture (e.g., the comic book 300, the off-Broadway musical Hadestown). My goal is for seminar participants from any discipline to be able to incorporate reception theory into their own courses and research, as America constantly (and often surprisingly) re-fashions its own identity by using (or abusing) the classical past. Lastly, in New York City, we will take advantage of any contemporaneous art exhibits or theatrical events that illuminate the themes of the seminar. Thomas E. Jenkins is professor of classical studies at Trinity University in San Antonio, TX, and director of the Collaborative for Learning and Teaching. He is a past fellow of Harvard’s Center for Hellenic Studies and the American Council on Education, with research that cuts across a wide swathe of disciplines, including classics, theater, film, and gender studies. He was the winner of the inaugural Paul Rehak award for best article in LGBT studies in classics, and his recent book, Antiquity Now: The Classical World in the Contemporary American Imagination (Cambridge University Press, 2015), was named an Outstanding Academic Title by Choice for 2016. As an arts and theater critic, Tom’s work has appeared in both local media and national journals, and his goofy stage adaptation of Plautus’ The Haunted House premiered in 2013. Do you need release-time in order to pursue your research? Do you need a mentoring or tutoring program to help your students succeed? Do you need to equip a lab with sophisticated equipment? All of these needs can be satisfied if you can learn to write competitive grants. This workshop will help you prepare strong grant proposals. We will examine the components of a successful grant proposal: finding a potential funding source, analyzing an RFP (Request for Proposals), researching and stating the need for the grant, writing appropriate goals and objectives, describing the proposed activities and methods, and developing a credible evaluation plan along with a realistic budget. The presenters will share their experience and accumulated wisdom. However, at the heart of this hands-on workshop is the opportunity for each participant to make substantial progress in developing his or her own idea into an actual grant proposal. Each participant is asked to bring an idea for a grant proposal—whether you are a faculty researcher looking for release-time and equipment, a department chair or academic administrator seeking to expand a successful program, a student affairs administrator looking to create a new student support program, or an IT specialist or librarian looking for additional resources. Bring a paragraph to the first session that describes your idea. Participants will develop their ideas during the seminar by outlining need statements, goals and objectives, action plans, and the other components of a complete grant proposal. The seminar will introduce some of the most helpful grants-writing resources available online and will include readings on how to construct a grant. Participants will be glad to hear that the presenters specialize in readings that run no more than 2-3 pages and get right to the heart of the topic. The seminar is designed for both beginners and intermediate grants writers. Beverly and Bob Kahn are political scientists who have written grant proposals together and separately for many years. After receiving their doctorates from Indiana University, where Beverly specialized in Italian politics (winning both a Fulbright and Rome Prize) and Bob specialized in African American political ideology, they both taught at the University of South Carolina and The Ohio State University for 17 years before going off on separate careers as administrators. Beverly has served in the roles of dean, vice president, and provost at Fairfield University, Pace University, and SUNY-Farmingdale and has authored more than $20 million in grants. In her current position at SUNY-Farmingdale, Beverly has written more than $12 million in major grants, including a First in the World Grant, a Title IIIA grant, and an SSS Trio grant (plus renewal) from the U.S. Department of Education as well as a Smart Grid grant from the U.S. Department of Energy. Bob has served as dean, vice president, and grants director at Rockland, Bergen, Queensborough, and LaGuardia community colleges. In eight years at LaGuardia as grants director, Bob’s college brought in more than $100 million in grants––making LaGuardia, annually, the highest grant winner among City University of New York community colleges, higher than a number of CUNY four-year colleges, and usually more than twice as much as the CUNY community college in second place. Most recently, he has worked on special projects in the Grants Office at CUNY’s Advanced Science Research Center.